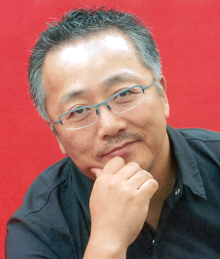 Mangaka-turned director Katsuhiro Otomo (born April 14, 1954) has been working in the field of manga since the 1970s. His first "short stories" were published in 1973, while he was still in college; three of his more famous short pieces were adapted into the film Memories in 1995. Between 1980 and 1982, he published Domu: A Child's Dream, which contained themes and imagery he would expand on in his six-volume magnum opus, AKIRA. After taking charge of a film adaptation of AKIRA, Otomo made the jump from comic artist to film director; to date, he has six feature-length animations and two live-action movies (World Apartment Horror, 1991; and Mushishi, 2006) to his credit. In 2012, he announced his plan to return with a Shōnen manga set in Japan's Meiji period. This will be his first full-length series since AKIRA, although it appears to be in Development Hell. His dark, obsessively detailed Cyber Punk style has influenced dozens of artists, both in and outside of Japan. The film adaptation of AKIRA was a breakthrough success in the west and ushered forward an interest in anime in mainstream Western cinema, as well as a "second wave" of popularity among anime fans. A yet unnamed Shōnen manga set in Japan's Meiji period.